At the intersection of the Murray and Campaspe Rivers, Echuca became the largest inland river port in Australia, the Murray-Darling system allowing wool to be shipped from New South Wales to Victoria. With the opening of the rail link to Bendigo in 1864, Echuca had direct access to both the Melbourne market and the export trade of wool from Melbourne to Britain. Between 1865 and 1867 a huge wooden wharf took shape, 10 metres high, to cope with tidal change, and 75 metres long. By 1884 it had grown to 332 metres in length. Paddle steamers plied the route, as they still do today, but now the only trade is in tourists. Dramatically reduced in length during World War II, back to 75 metres, the red gum wharf remains Echuca’s most notable heritage attraction. The town’s commanding and more modest nineteenth century structures are preserved under a conservation plan. Echuca is a regional city in northern Victoria, situated on the south side of the Murray River where it is joined by the Campaspe River. Echuca is 185 km in a direct line north of Melbourne, and is reached by the Northern Highway. The name is thought to be derived from an Aboriginal word describing the local Aboriginal grouping or their location at the 'meeting of the waters', ie the two rivers. Echuca began as a place for conveying Riverina wool more cheaply to Melbourne than to Sydney. In 1844 James Maiden opened a punt across the Murray River at Moama. Within about two years a contemporary of Maiden's (and who incidentally had been convicted at the Lancaster Assizes on the same day), Henry Hopwood, became the overseer of a boiling-down works at the future site of Echuca. Hopwood built an inn and also installed a punt across the Murray River. In 1853 Hopwood gained a licence to occupy land which in a few months coincided with the area reserved for a township. The need for a township had arisen from large numbers of cattle being driven from New South Wales to the Victorian goldfields, crossing at Echuca. There was also need for a site for police, because of outbreaks of lawlessness. The township was surveyed in 1854 and Echuca's first land sales occurred in 1855. Over the next 14 years Hopwood was influential in developing Echuca. He enlarged his inn, established a butchery and built an iron bridge comprised of ten sections across the Murray River (1857). He later built and operated a toll bridge over the Campaspe River. Echuca became a busy trans-shipment centre for food and goods for the goldfields, and for carrying wool downstream by Murray River boats. A school was opened in 1858. In 1863 a second sale of town lots occurred, and sales were good, in anticipation of the completion of the railway line from Melbourne via Bendigo. The completion of the railway coincided with the formation of the Echuca Road Board (1864), extending eastwards to Yarrawonga, the Echuca borough (3 January 1865), the opening of Wesleyan, Catholic, Anglican and Presbyterian churches (1864-68) and the provision of a town water supply (1867). By the end of the decade pastoral runs were giving way to farm selections, which produced cereals, fruit and dairy goods. Red gum timber cutting resulted in railway sleeper and mining-prop exports from Echuca. Between 1861 and 1871 the borough's population grew nearly threefold to 4789, a figure not to be regained until about 1950. By the 1890s Echuca's prosperity suffered some setbacks: sawmills in north-eastern Victoria cut into Echuca's trade, soil exhaustion lowered wheat crops, and extension of other railway lines to the Murray River from Melbourne and inland from Sydney eroded Echuca's freight throughput. 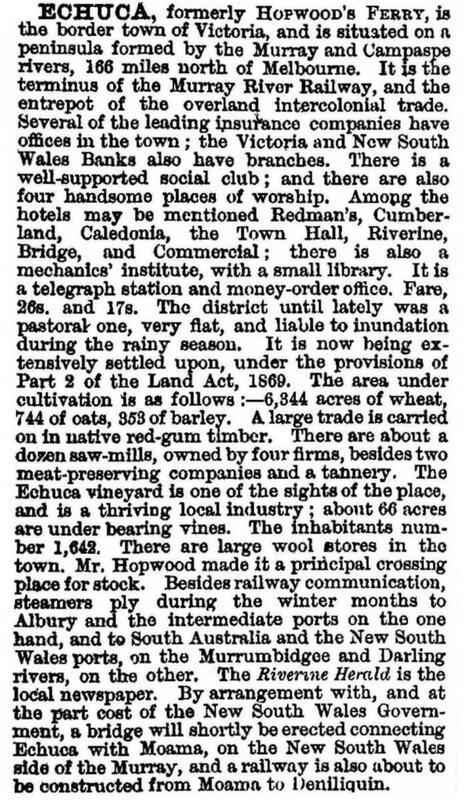 Echuca's three flour mills (1884) were bypassed. The river-port traffic was uneven during the 1880s and halved during the next decade. Between 1900 and World War II Echuca's population stabilised at around 3700-4400 people. The town had numerous institutions dating from earlier years – grammar and convent girls' schools, a hospital (1881) and gentlemen's and working men's clubs. Technical and high schools were opened in 1910 and 1912. Irrigation works slowly approached Echuca, and local ones drawing water from the Campaspe River grew fruit and vegetable crops. 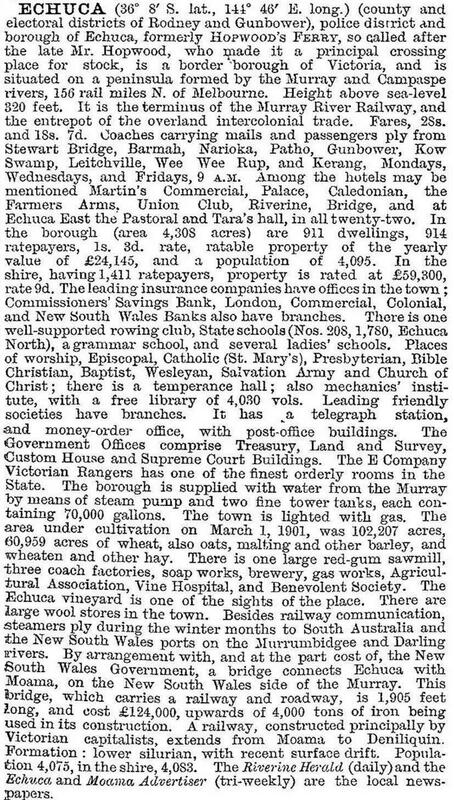 A butter factory (1904) and a cooperative butter factory (1906) slightly diversified local industry, but it was not until the 1920s that the Torrumbarry Weir on the Murray River and the western channel of the Waranga Basin reservoir brought concentrated irrigation to the district. Sawmills revived in the 1920s, and more irrigation from the Mulwala and Wakool schemes converted wheat lands to dairying and sheep fattening. Stock saleyards in Echuca were expanded in the 1930s. By then, there was only the Echuca Flour Mill left, and it surprised many by continuing until 1981. 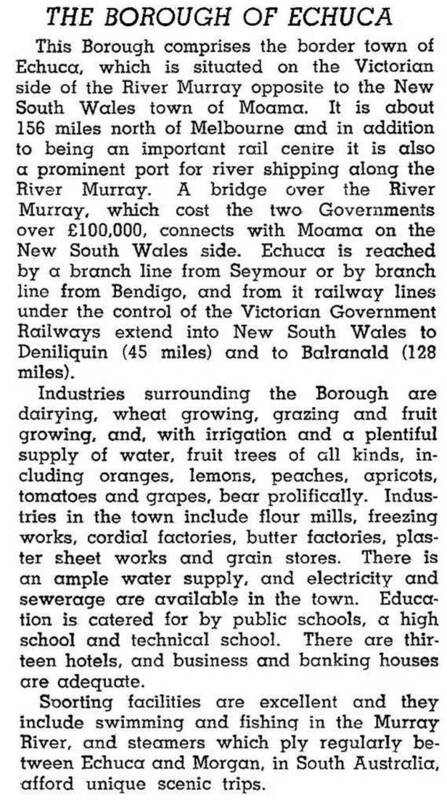 By 1970 Echuca had a tomato-processing and cordial factory, Ibis Milk Products factory, a rice-growers cooperative mill, a machine-bearings factory and other food processors. At that time Echuca embarked on expansion in the tourism sector: the first annual Rich River Festival was held in 1971 and the restoration of the historic port area was undertaken. The port adjoins the narrow neck of land between the two rivers, with the town's commercial and shopping area to the south, and recreational and open space to the west where the rivers finally join. During the early 1980s the television mini-series All the Rivers Run was filmed at the historic port. The machine bearings factory closed in 1976, and the site was converted to an industrial estate eventually employing 1200 people. Population growth and the growing need for secondary education led to a new high school building in 1968 and a fourth State primary school, Echuca South, in 1971. Population also put pressure on the old High Street shopping area, and motor car travel extended Echuca's retail catchment - as far west as Pyramid Hill according to the Council - as well as creating a need for off-street parking. Supermarkets were built in Hare and Annesley Streets, between High Street and the railway station: Hare Street became the new main street. Echuca has numerous tourism facilities associated with its historic port - three museums, art and craft galleries, paddle steamers, two motor museums (including the National Holden car museum), and in 1995 it had 20 hotels etc which provided 1276 bed spaces. Caravan parks and camping grounds provided 794 sites, including cabins. There are several recreational areas, and Victoria Park west of the historic port includes a sports oval and the riverside caravan park. A golf course adjoins the Campaspe River south of the town, and the racecourse is on the Murray Valley Highway. Among Echuca's registered historic buildings there are the former court house (1881), town hall (1868), Permewan Wright offices (1866-70), customs house (1858) and irrigation pumping station (1884). The former police station is an historical museum. Many of the buildings are in a registered conservation area. In September 2010 and again in January 2011 many parts of regional Victoria experienced widespread severe flooding. In Echuca floodwaters came down the Campaspe River which flows into the Murray. Most of the town was protected by a levee bank but many low lying houses were affected. An emergency relief centre was opened at Echuca Secondary College. In 2013 the rail line between Echuca and Toolamba, near Shepparton, reopened. The hospital was expanded in 2014, and plans were in place for the construction of a second bridge between Echuca and Moama. The merger of three primary schools – Echuca West (137 pupils, 2014), South (185 pupils, 2014) and Specialist (116 pupils, 2014) schools – was also underway.